The Western blot is an assay intended to detect a single protein in a mixture of proteins, similar to the ELISA. Also similar to the ELISA, it requires an antibody specific to the protein that is intended to be detected. However, the Western blot is not performed in a well plate, and involves a separation by molecular weight. The Western blot involves three steps. First, proteins are separated by size via gel electrophoresis. The gel electrophoresis bands are then transferred to a membrane or solid support. The membrane then is incubated with primary antibodies specific to the target protein, followed by washing, blocking, and incubation with secondary antibodies that are linked to an imaging molecule (either via fluorescence or a colorimetric enzymatic tag). Antibodies that have not bound to the protein target are washed off, and the film is developed to determine the amount and size of proteins that bound with the antibodies. In addition to the standard Western blot described above, we perform Western blot analysis using automated ProteinSimple’s Wes Western blotting system. This highly sensitive automated Western blotting system can run 25 samples simultaneously, utilizing a novel capillary system (24 experimental samples + 1 MW Standard sample). It can detect protein at the nanogram level in nanoliter-volume samples, decreasing the sample size required for quality control. In addition, its three-hour run time allows us to have same-day verification of protein expression. 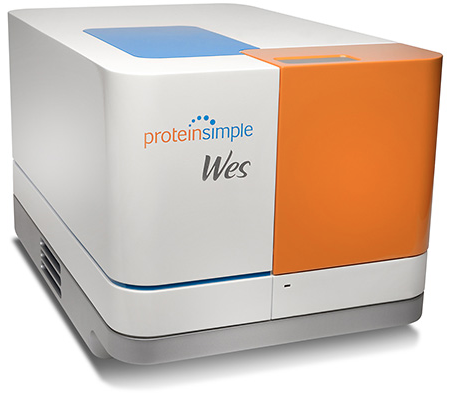 Use of the Wes allows Western Blot Service to generate quantitative protein expression data and provide exceptional quality control for the protein expression experiments.